As a welcome the A.A.C. (Asociación Argentina de Compositores) has programmed my Sonata for violin and piano in their first concert of the 2019 season. 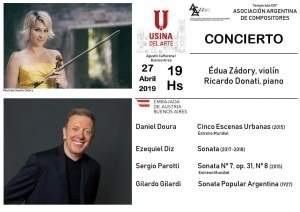 In the hands of Édua Zádory (Austria / Hungary) in Violin and Ricardo Donati (Argentina) in Piano, on Saturday, April 27 at 7:00 p.m. in the USINA of Art in the autonomous city of Buenos Aires. On the other hand, I sincerely appreciate having the possibility of sharing and fraternizing with incredible colleagues such as: Daniel Doura, Segio Parotti and Gilardo Gilardi. It is an honor to be part of such a distinguished institution where the works of Argentine authors have a leading role. Argentine composer, consolidated as a reference of his generation. His music articulates contemporary tango with classical music, thus composing a new aesthetic called Tango de Cámara.